Situated on the north of the island, close to the centre of the fishing village of Elounda is the location of this family run establishment. The beach is just 5 minutes away and there are shops and eating places nearby. Visitors can travel to the neighbouring town of Agios Nikolaos or take a boat trip to explore the historical island of Spinalonga. There is a frequent bus service with access to other areas of the island. Facilities provided at the hotel cater for the client's needs. 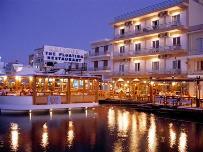 The on-site restaurant serves breakfast and a la carte Cretan food whilst the adjacent tavern serves sea food. Rooms are air-conditioned, tastefully decorated in light colours and have balconies with either sea or garden views. All the essential elements needed to make the guests feel at home have been provided. This is a non-smoking hotel and pets are welcome on request. Address: Elounda, 72053 Crete, Greece.